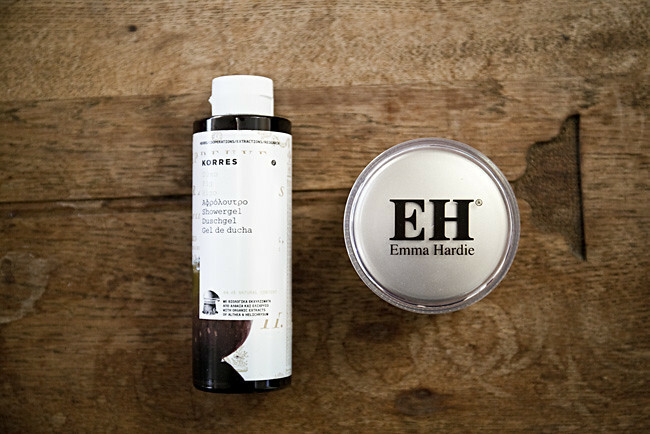 A couple of weeks ago, Feel Unique had a 25% off sale going on selected skincare, and as I'd been eyeing up the Emma Hardie Amazing Face Natural Lift and Sculpt Moringa Cleansing Balm (yikes, I'm referring to it as 'EH Cleansing Balm from now on, okay?) for a long time now, I thought this was a good opportunity to finally pick it up and see what all the fuss was about! I also decided to pick up a bottle of the Korres Fig Shower Gel, which was also on sale at the time and came in a double pack - for the same price as one! I can't remember where I got the sample from, but I had tried this shower gel a few weeks back and decided I loved the scent. It's very natural, and earthy and a nice change from the usual shower gel scents I'd used previously. It seems I have a bit of a thing for fig-y scents! Anyway, regarding Emma Hardie. The internet's favourite cleansing balm. I don't really love it, to be honest. I feel like I may get a few shocked responses and WHY? WHAT'S WRONG WITH YOU? I'm expecting it, it's okay. Go ahead. Get it out of your system. That scent, I don't like it. I'm so sensitive to smells, and this one just seems to really get to me. Everyone raves about it, and honestly it's not the usual scent to accompany beauty products, which is a nice change. Unfortunately though, it bothers me so much. Even after I moisturise, I can still smell it all night on my skin, and it puts me off using it again. Me and my damn nose, so picky. Second, I don't love the way it feels necessarily. I like the idea of a balm, and you'll know I love my Clinique Take The Day Off Cleansing Balm, but this one seems a little different - I think it may be that it turns into more of a cleansing oil when warmed up on your skin, rather than a 'balm'. I realise some people really love this, so it's not criticism, I just personally don't love how it feels. I also feel like it may be a bit too rich for me, especially for daily use. I haven't had any negative reactions from it, but it is a very heavy, very rich product and I noticed after a few days of using it consecutively, my skin started feeling a bit on the oily side, and not as fresh as it normally feels after a clean. It's not that I dislike this product, I'm just very underwhelmed by it. I still much prefer the Clinique Cleansing Balm, as I feel it gives me a much fresher, and cleaner result. I also am still in love with the way the Clinique Balm feels when massaged into my face - soo luxe. I'm going to continue alternating between the Emma Hardie and Clinique cleansing balms, as I hate wasting product (especially since EH was so expensive) and it honestly still does a very good job. I'm a bit fussy with these kinds of things, so I'm well aware this is a somewhat surprising review. Not everyone's cup of tea, I guess! I feel like if you have a tendency towards dry skin, this would be an amazing cleanser. It certainly does not strip your skin, it leaves you with very soft, hydrated skin which feels lovely, but also does a great job of removing makeup. It's also great around eyes, and at removing eye makeup (especially waterproof mascara, which is great!). Overall, it's a lovely cleanser, but I can't justify that price tag for me, personally. I will use it up, but unfortunately will not be repurchasing.